I like my bikes with knobbly tyres, long-travel shocks and panniers for lots of gear that I don’t need to take and will never use. So, when I saw the little GSX250R, all spiffy and sparkly in its, er, loud Moto GP paint job, I admit my heart didn’t exactly thump with joy. Even as the Suzuki rep gave me a quick pep talk, I was wondering why the hell I’d stuck my hand up to test ride a sportbike, and a wee one at that. But, hey, whatever. She started with a decent throatiness and even as I wheeled the little bike out of the depot, the world felt different. In fact, I felt like the famous sparrow perched on the Rock of Gibraltar. Which, as it turned out, was no bad thing. 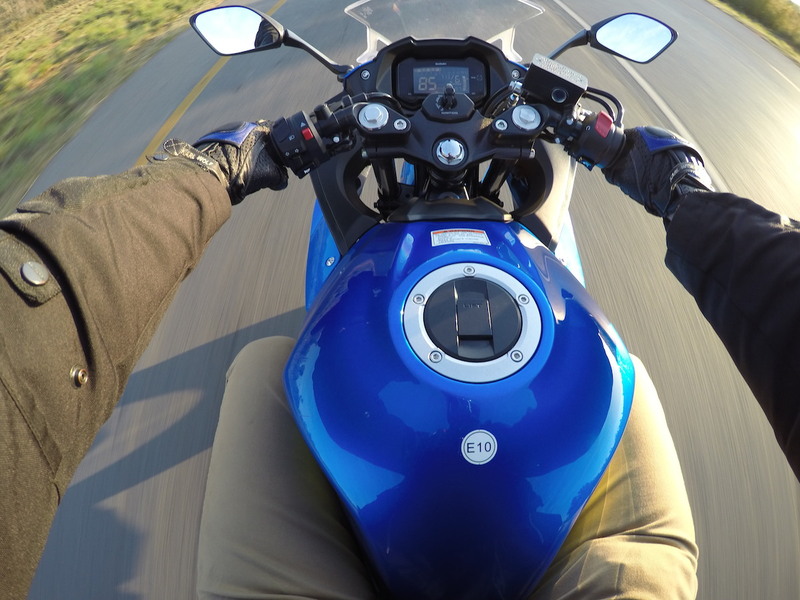 The first ride home in the chaos of Johannesburg’s chaotic rush hour traffic revealed little in the way of the Suzi’s potential, but we can blame pilot error rather than anything else. I had also left my Respro pollution mask at home and I get ratty when breathing other people ’s exhausts — how runners cheerfully jog along main roads while inhaling that crud is one of life’s great mysteries. The next day, as one always does with a new toy, I took it to work. Now my commute is just 10km or so but the roads are mostly terrible, with endless stretches that look like bombsites in London in about 1940. Add the aggressive wankers using their SUVs as weapons plus speed humps, minibus-taxis travelling at the speed of light and soccer moms with vision problems and you’ll understand why even a small commute like mine is a cocktail of evil. The Suzuki handled it all beautifully. A crisp throttle and slick gearbox got me quick away at the lights and that nicely tuned 250cc parallel twin kept me ahead of the pack for block after block. (That said, one has to keep a beady eye on the traffic behind because of the aforementioned issues to which must now be added two more hazards: poorly maintained brakes on the taxis and an entire population of people driving fast while dicking about on their phones. The (optional) ABS is a must-have, even if you have to shell out more bucks for it. On one early morning ride, I misjudged an amber light and hauled heavily on the brakes. The stopping power was breathtaking. Of course, that same amber light meant vokkal to the two genius car-jockeys who shot past me on each side at warp speed – and nearly took out another genius who felt that waiting for the green on his side of the intersection was beyond the limits of his ability. On the road home from Broederstroom. While we might regret those extra kilos out on the open road where the engine will feel the weight, in town they helped give the bike a certain presence. And presence, as anyone who has ever ridden a bike on these mean streets will know, is everything . After a couple of commutes, day and night, in all kinds of traffic, I was in love. It helped that the bike gives a deep and satisfying chesty rumble when you back off the throttle, making you — and everyone around you — aware that here comes trouble, but in a good way. It might be that “Katana DNA” that some people — including Suzuki — are talking about that has found its way into the GSX250R, but Suzuki have obviously worked hard on getting the balance right. The result is a bike with excellent road manners, one that will not intimidate smaller or newer riders, and yet feels like a pukkah sportbike. The acid test for me, though, is how a bike copes with the open road. 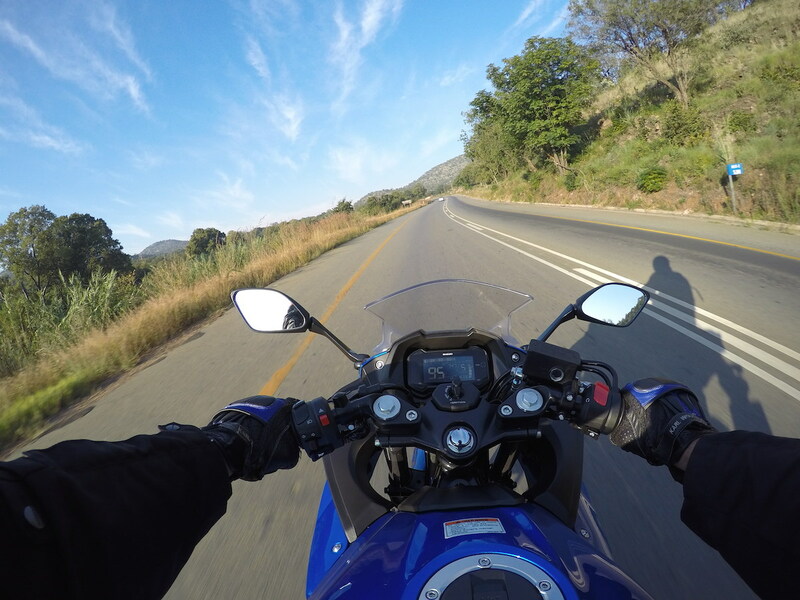 I took the little GSX out for a couple of long rides to savour the early morning emptiness of the Broederstroom road, north of Johannesburg. While it begins to run out of puff around 120km/h — 8 000RPM, or so —it also didn’t feel like the motor was shrieking like a banshee and about to tear itself to bits. The seat is comfy enough for a couple of hours in the saddle and I figure the GSX250R would make a pretty decent weekend touring bike — with credit card because you ain’t putting panniers on it and there’s barely room for a tank bag. As for the Moto GP paint job, well, apparently South Africans can’t get enough of it. Me, I’d want it in black. And if I had a spare 70 000 grand (ZAR69600 or US$5195.55 at today’s exchange rate, to be exact), I’d buy the “Baby Katana” in a flash.